Tony Hunt rushed for more than 1,000 yards the last two seasons. TIM SHAW says he and Paul Posluszny consider it almost their sacred duty to uphold Penn State's reputation as "Linebacker U'' in the NFL draft, the league's annual 2-day roundup of college talent that begins tomorrow. Shaw is a projected third-round selection as an outside linebacker after spending last season out of position as an undersized defensive end, while Posluszny, a two-time All-America, is widely regarded as a consensus first-rounder. "It means something to us,'' Shaw said. "It's a distinction, a tradition we want to uphold. "Somebody pointed out to me that Paul and I will be the first linebackers from Penn State to get drafted since Brandon Short and LaVar Arrington [in 2000]. That's way too long." But if having the imprimatur of "Penn State linebacker'' is generally seen as a plus on draft day, the same can't be said of former running backs for the Nittany Lions. 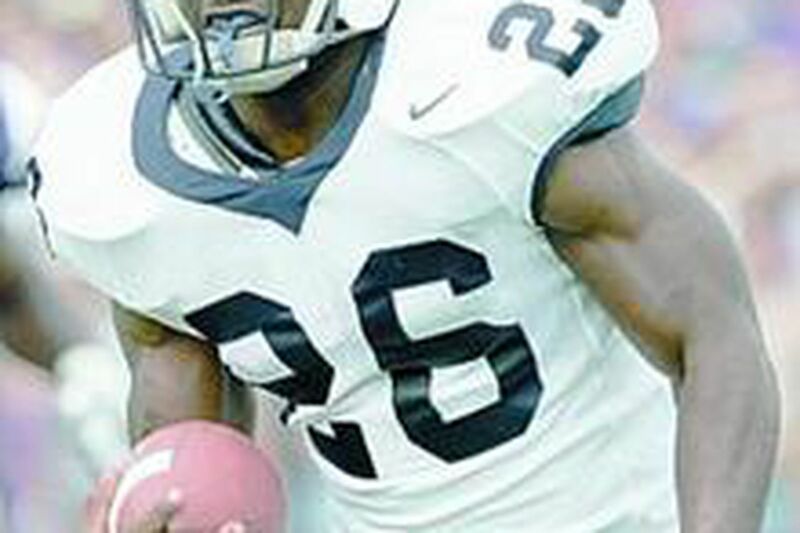 Tony Hunt, who rushed for more than 1,000 yards his last two seasons in Happy Valley, including 1,386 in 2006, like Shaw is appearing in a lot of mock drafts as a possible third-rounder. But he is aware that the recent history of Penn State running backs in the NFL has not been as rewarding as it has been for linebackers - not that he believes the past, for better or worse, necessarily portends the future. "I give a team a complete back, somebody you can put in any situation,'' said the 6-2, 230-pound Hunt, whose slipping NFL stock can be traced to a middling performance at the league's combine in Indianapolis, where he reportedly showed up slightly overweight. As for suggestions he isn't fast enough or a capable enough receiver to produce at the "next level'' as he did at Penn State, Hunt downplays the significance of drills used to measure a player's NFL potential. "I think it's a little overrated,'' he said. "I don't know how much you can tell about a guy from watching him run a 40-yard dash. There's no point in a football game where you're going to come out of a start and run 40 yards straight. Galen Hall, who is in charge of the Penn State offense as well as coaching the running back, agrees that too much emphasis sometimes is placed on stopwatches and bench-presses. "Who you draft is a very important decision, so a lot goes into the process and that's a part of it,'' Hall said. "But sometimes you can overthink it. What has a kid done on the field, where it counts? Although Penn State product Larry Johnson is one of the NFL's premier running backs, he has been the exception to the rule of late. Last week, Fox Sports.com writer Eric Moneypenny compiled a list of the "top 10 running back draft busts'' of all time, and three former Lions were on it - Curtis Enis (No. 6), Blair Thomas (No. 4) and Ki-Jana Carter (No. 1). All were high first-round picks whose NFL careers never quite panned out. "You're talking about guys who had major injuries [as pros],'' Hall pointed out. "There's nothing you can do about that. That's just bad luck. Five of Penn State's draft-eligible players are expected to be selected on the first day. Left tackle Levi Brown, a 6-5, 328-pound road grader who cleared the path for Hunt, almost certainly will be one of the first 10 players chosen. Posluszny - another highly productive college player whose measurables have been called into question by some NFL personnel directors - might slide toward the end of the first round, with Hunt, Shaw and defensive tackle Jay Alford a bit further down on most teams' draft boards. Posluszny supporters view him as a latter-day version of Ohio State linebacking great Randy Gradishar, another two-time All-America linebacker who was the 14th pick in the 1974 draft, one spot after another Buckeyes linebacker, Rick Middleton, was chosen. Middleton tested larger and faster at the combine, but was out of the NFL after two seasons; Gradishar, a key member of the Denver Broncos' renowned "Orange Crush'' defense, played for 10 years and was named to the Pro Bowl seven times. You won't hear Shaw downplaying the value of combine numbers. He tested off the charts, with 26 repetitions of 225 pounds in the bench press and a time of 4.43 seconds in the 40, absurdly fast for a linebacker.